Winter in Chicago-land can feel never-ending. Especially with toddlers who have lots and lots of energy. I am always on the lookout for ways to entertain and blow off some energy that will not break the bank. I will not lie, moving to suburbia has made this much harder. I find that there are far fewer free open gyms and play-times then I had access to in the city. It seems that everywhere charges a minimum of $6 per child, some play places even charge the adult admission! What? I won't be using any of the facilities! I don't fit! When you add more than one child, costs of snacks (if they won't let you bring your own) and all the other extras a morning out can easily run $20-40, which makes it a once in awhile activity not something you (or at least we!) can do regularly. That all changed last winter when someone introduced us to Pinstripes: Bowling, Bocce and Bistro**. Now I will admit I was skeptical at first. I grew up in bowling alleys. Both my grandparents bowled in leagues. My Grandpa semi-professionally. As much as I enjoyed it growing up it's something I haven't done with my children. I haven't done it because quiet frankly bowling alleys tend to be dark, smokey and dirty. If you have young children who like to explore and who have been known to crawl around on the ground, it can be gross. As much fun as bowling was growing up, the germaphobe in me kept us away. When I got the invite to Pinstripes though it looked different, there was the new no-smoking in public places law and it came with fruit and yogurt how bad could it be? It was not bad at all. In fact it is the best time, and best value in all of Chicagoland for entertaining your children (and I was in no way paid to say that!). Seriously! We have frequented their Mom and Tot bowl about a half a dozen times. For $10 ($5 per child) my children can bowl as many games as they can fit in 2 hours (with preschoolers that's about 2 games). They can eat all the fresh fruit and yogurt they can fit in their mouths and mommy can drink all the coffee (with gourmet syrups!) that she can drink. Oh and if mommy wants to bowl, it's free for her! The bowling alley itself is clean and bright, there are huge windows, WINDOWS, along one side of the lanes. There are big comfy leather couches for the kids to hangout on and wood floors (no gross carpets!). The staff is generally attentive, but not in your way. I think that they are aware that most of us will only be partaking in the free stuff so they don't hover. this can be a problem if you are trying to order food, but no more so than any other restaurant I have visited. The lanes are totally computerized. You choose who gets bumpers and who doesn't and it does all the scoring for you. They also have ramps that the kids can use if they aren't strong enough to throw a ball. 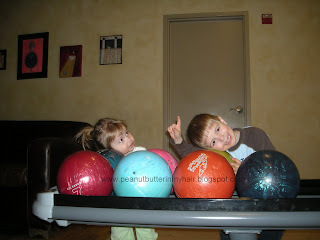 This makes the bowling suitable not just for Mom's and tots, but big brothers abd dad's too! One morning I went we had children age 18mo to 10yrs bowling and having fun. There are not many places that can do that! The last time we went, we went for their Afternoon "Recess" program which runs from 3-5pm. For $7 per child the kids get a snack, juice box, and 2 hours of bowling. Again free bowling for the parents. My husband meet us after work and we decided to stay for dinner. The food there is not at all what you would expect from a bowling alley. Check out the menus (and some pictures) here. It is the tastiest and most affordable "bar" food anywhere. The kids meal is $7 and they get an appetizer, meal, drink, and dessert. Oh and the plates are HUGE. So I only buy one, because Peanut will only eat two bites of anything. I once got Peanut her own plate and I ended up eating it myself. The adult food is great too! The night we were there the special was $2 burgers, which are huge and tasty! We spent $24 on the meal (that's almost as cheap, and certainly better than Mcdonalds! It also included 2 sodas) + $14 on the activity for a total of $38. Not bad at all! There are two locations, South Barrington and Northbrook. If you're looking for something to do and are tired of the mall play areas and the bounce house scene you should go visit Pinstripes. It's certainly a Fab Find! ** Disclosure. This review was written after visiting the Northbrook location, I have not been to South Barrington but assume it's just as fabulous. 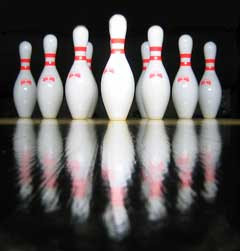 I was not compensated by Pinstripes in anyway, we paid for our own food and bowling.All opinions expressed are my own. My son may be on the young side for this (he's only 18 m/o), but it sounds like a great place to take kids. We've been getting stir crazy, so we may have to go try it out! We had Almost6 when we lived in Chicago. We lived in Edgewater and it was a heavenly place to have a baby. No need for playdates--you could always find a friend at one of several nearby playdates. I will have to join you next time you go. That sounds like a blast. This last week was really crazy, though. Thanks for this review. So good to know about!